Chocolatier-on-wheels Petra Barran loves a good chocolate pudding and wants to bring it over to yours for dinner. She talks to Londonist as she gets ready to embark upon her Chocstar Tour of Britain. 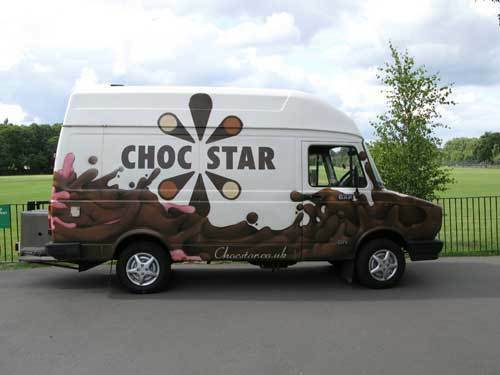 Tell us about your business selling chocolate on wheels, Chocstar. Where did the idea come from? At some point I decided on an ice cream van with all things chocolate. Not in a snooty high-end way though. I needed to buy a van. I trolled around on eBay, which is full of ice cream vans. I found this van and really fell in love with it. It was all the way up in Inverness and I was all the way down in London. I sent a text around to everyone I knew asking if they knew anyone in Inverness who could look at the van. I bought the van in May 2005. I bought it without looking at it myself. I absolutely fell in love with it. The road trip [to get the van] was the beginning of me thinking “I really want to do this…go on the road….you never know who you’re going to meet.” I was introduced to this graffiti artist who painted it for me. I got it done up inside. I started doing Portobello—but the wrong end of Portobello, making tea for people instead of serving chocolate. I did a few polo matches. It was rocky in the beginning. But then I found Brick Lane and from then on, it was really good. And then I started getting press. Tell us about your passion for chocolate…what are your favourites? In this country, I really like William Curley. I like L’Artisan du Chocolate. Paul Young does some good stuff…he’s quite interesting. I love Willie Harcourt-Cooze’s chocolate stuff. It’s so homemade and real. It tastes like a fruit instead of a refined product. You have to taste his chocolate to understand what it does for you. There are loads of small producers. There are very interesting producers in Spain. In Barcelona, Cocoa Sampaka does funky flavours in really nice and interesting ways. I can’t even talk about the chocolate-makers in Paris. All those back-streets! Everyone talks about Venezuela as the Rolls-Royce of cocoa. Parts of Mexico are growing production of really good beans. I really like Javanese chocolate. They grow the beans by coffee plantations so you get these spicy notes. With Ecuadorian chocolate you get these earthy flavours. In Madagascar, they make some really creamy, mellow chocolate. How much chocolate do you consume on a daily basis? Probably not as much as people would think! I do eat chocolate bars. My favourite way of having chocolate is in a chocolate pudding, warm, cakey, with cream. I do love eating dark chocolates. I do always have a bar of chocolate in my bag. I would love to see the psyche of this country changing. People have this hang-up about eating sweets. So they have this unhealthy relationship with it. You should allow yourself to have stuff and be balanced about things. The number one thing people say to me is “How are you not the size of the house?” You don’t need to have everything. What do you wish London had more of, food-wise? I really like the idea of a dessert bar. There’s a rice pudding place in New York called Rice to Riches with all these different types of rice pudding and the design is amazing. There’s a similar place in San Francisco. William Curley has something like that in Shepherd Market where you can go for your pudding and it’s open til 10 at night and they make it in front of you. I’ve always loved the idea of living in a town which is a nice size where you can all pop out for dessert together. Obviously there are all these artisan bakeries and cupcake places popping up. There seems to be a sweep back towards things that people understand and tangible things that people can recognize like home-baked cake. Everything else has just started getting too complicated and over-the-top and far beyond what people can understand. Give us the low-down on the Chocstar Tour of Britain. Where are you going? Why? What’s your ultimate goal? The idea is that people invite me for supper as I tour around the country. It can be anything. It can be tripe and bacon or a TV dinner. I turn up in my van with my pudding. Maybe I have to bake it in their oven. 99% of people will get a smile on their face with chocolate…it’s universal. I’m hoping I’m going to go from the very urban-ness of the cities to all the way out in the country to people who have lived here for a long time and people who haven’t. I imagine chocolate will have the same impact on everyone. I want to go to every single county in England, lots of Wales, lots of Scotland. I’ve never been to Shropshire, Isle of Hebrides, or Northumberland. There are some really beautiful parts of Britain. We spend so much time wanting to go away, but Britain is so beautiful and right here! I am going to go to as many parts as people will say “You can have dinner with us.” I just really feel like it’s the right thing for me to do. It’s my dream to travel around and write about it and meet new people. I’m just really interested in people and how where they’re from has to do with how they eat. Logistically, it’s a bit crazy. I’d like people to think of people who might want to have me over for supper, and I bring the pudding. It doesn’t need to be anything amazing or over-the-top. It’s purely for my own interest and the pleasantness of the situation. Anywhere people think will be an interesting part of the country to visit. Someplace really beautiful or quirky or maybe a café that does something interesting. I really love to write. I really want to start focusing on writing. I’ve got a blog and I’m going to be writing about my journey on the blog. Maybe I can turn that into a book or something like that. It’s going to be good practice for me to get my writing hand on again. You can find out where Chocstar is hanging out by checking out the Chocstar Web site and blog.